The Way We Use Information: We use return email addresses to answer the email we receive. Such addresses are not used for any other purpose and are not shared with parties outside Stonewall Democrats of Arizona. 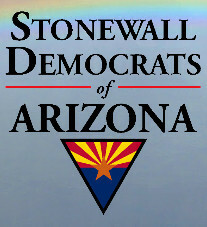 We use non-identifying and aggregate information to better design our website and to share with third-party groups associated with Stonewall Democrats of Arizona. For example, we may tell a candidate that 5,000 individuals visited a page concerning that candidate on our website, or that 8,000 men and 11,000 women filled out our registration form. At times, we may also exchange email addresses or provide emails to partners and/or candidates if we feel our members would be interested in information from those parties. If you have any questions about this Policy, please contact us at info@stonewalldemsaz.org.